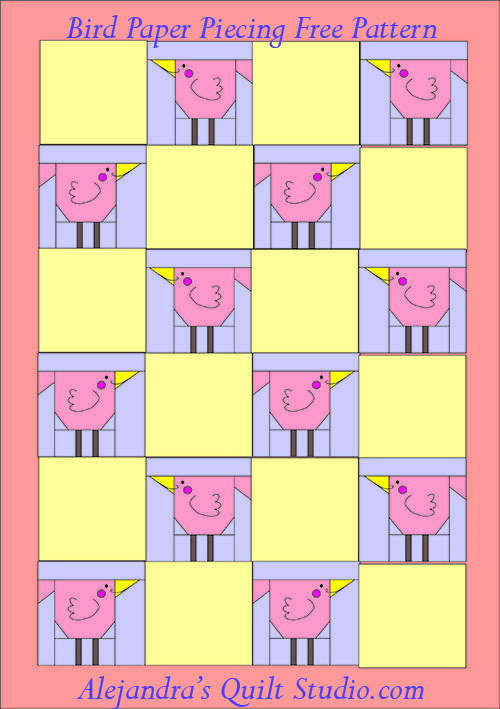 My new bird Piecing Pattern, I could work on my quilt this past week for a few days, I made two more rows and I already have 8 more blocks to add them to the quilt today. But I wanted to take a break and share with you all this pattern. 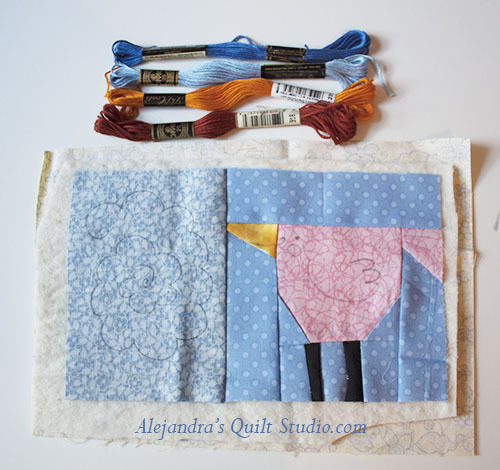 You know, sometimes little birds can tell little secrets, and this little one told me as it’s taking some time to finish this quilt, you might want to know what can you make with a small paper piece pattern. 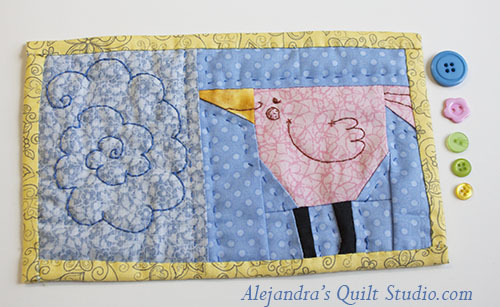 Small patterns are useful by themselves, and they can go in many ways as a single pattern project , this time you can download your free pattern to keep working on your quilt, but also you can make this cute Mug Rug. 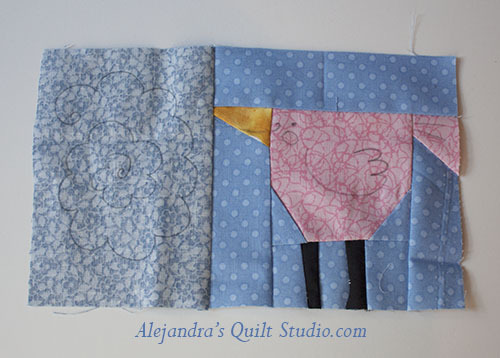 All you need to do is to print this time two patterns, as one you will make it for your quilt, and the second one, work it the same, even with the same fabric colors, as I did. Once you finish your second bird, iron it gently and trim it to 5 x 5 inches. Once you have the two fabric cut and the top, make the sandwich. It’s time to do some quilting, I did it by hand, with DMC embroidery floss, but if you prefer to do it by machine, it will look nice also. I did all the embroidery by hand also with DMC embroidery floss. Once you finished the quilting, trip the batting fabric to the same size of the top, and trip the fabric for the back, 1 inch bigger than the mug rug top. Now you can finish your Mug Rug by self biding. 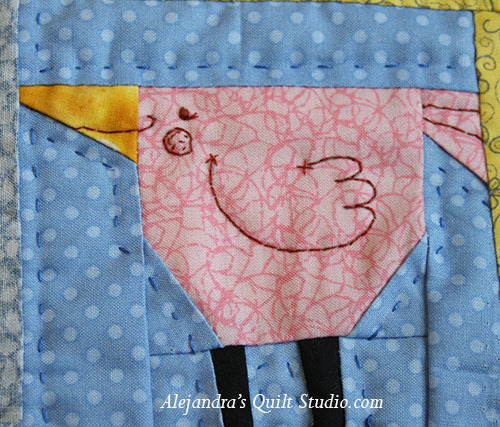 Your mug rug with this cute bird will look like this when you finish it. 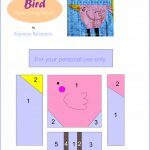 To give you more ideas on what you can do with a Paper Piecing pattern, I made this pattern to make a small quilt using this bird pattern and a 5 x 5 inches square, you can make the quilt as small or as big as you want to, just remember, this pattern size is small, if you want to work on a big quilt, it might take a few squares to make it. I would think a small quilt or a baby quilt will be perfect for a pattern this big. I hope you like this new Paper Piecing free pattern, if you use it, remember it is for your personal use, thank. If you find this pattern cute, and you plan to use it later, remember you can Pin It so you can find it later. Do you like to make Mug Rugs? Do you think Patchwork Mug Rugs are perfect to make for a present? I thank you for making time to stop to read my blog, I also thank you for your likes and shares! You can click here to download your pattern. 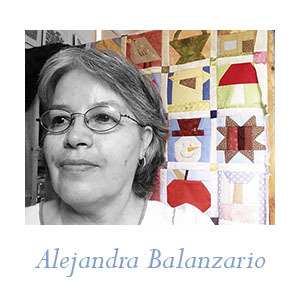 ← How To Design A New Quilt, Full Time Job.